In keeping with the theme, Jennifer makes iced tea sweetened with ginger ale, a cool refreshment on a humid summer evening. 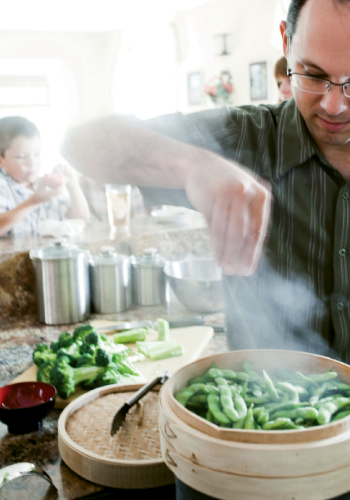 While the boys work, Marc steams some edamame for everyone to snack on as the main course cooks. 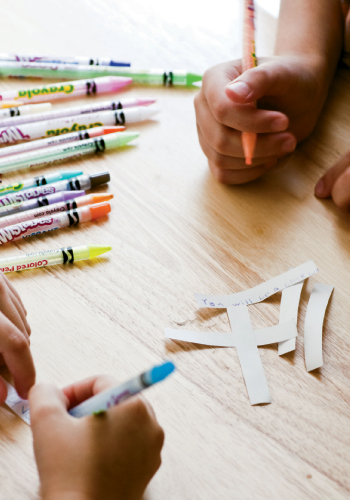 Using bright markers, Matthew and Christian pen fortunes to put inside the cookies; favorites include “You will be a black belt” and “In food there is love” (from Mom). Circa 1886 chef Marc Collins and his wife, Jennifer, turn cooking into a family affair, using time in the kitchen to teach their sons, Matthew, age 10, and Christian, six, about eating right. 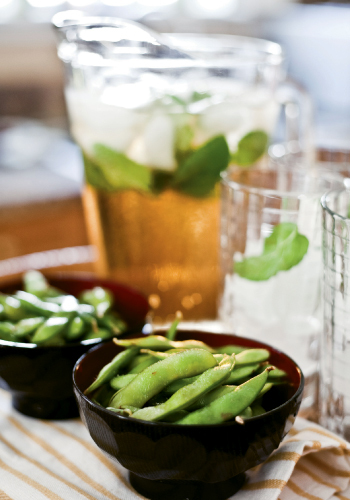 The night’s healthy Asian menu even allows for a delicious dessert. 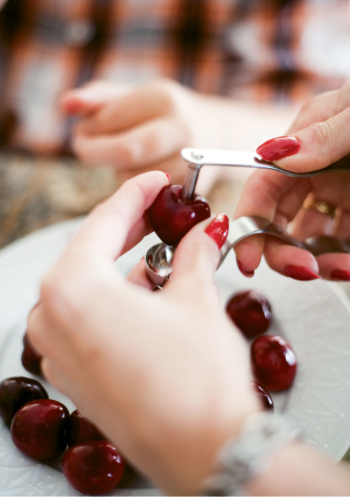 She and the children take turns using a cherry pitter to get the fruit ready for the applesauce. Value Added: A garlic soy sauce, thickened to gravy consistency, adds to the entrée extra flavor that pleases the adults. While an acquired taste for children, brown rice boasts many benefits that earn it a spot on the plate. 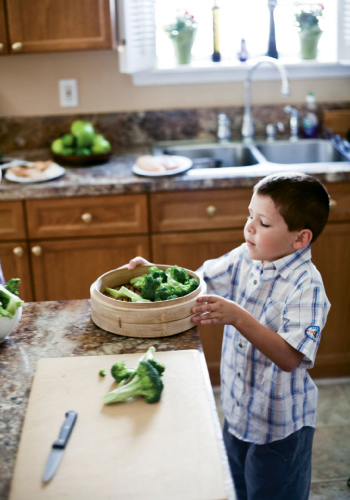 Veggie Tales: Christian pitches in by arranging the chopped broccoli in a bamboo steamer tray. 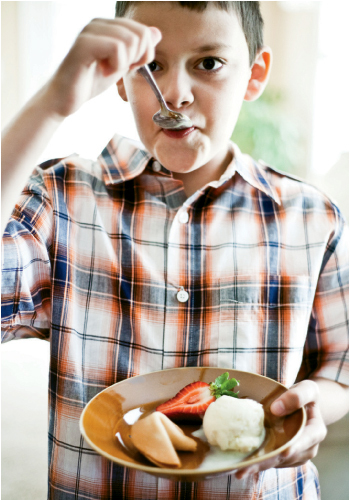 I Scream, You Scream: Like most kids, Matthew places ice cream at the top of his favorite desserts, so his parents treat him to low-fat gelato. Smooth Operator: With its vivid red color, sweet taste, and puréed texture, Marc’s cherry applesauce disguises nutritious fruits as fun fare. This side can be made up to three days in advance and refrigerated. 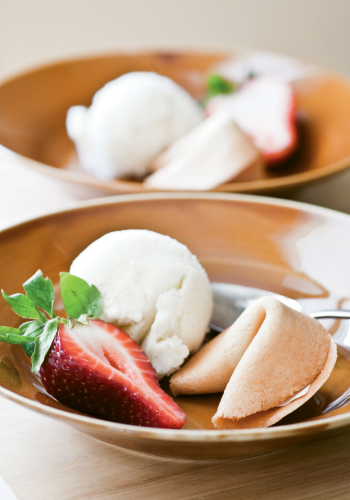 Served with vanilla-orange gelato, these warm homemade fortune cookies truly top the packaged version. To form a fortune cookie: 1. 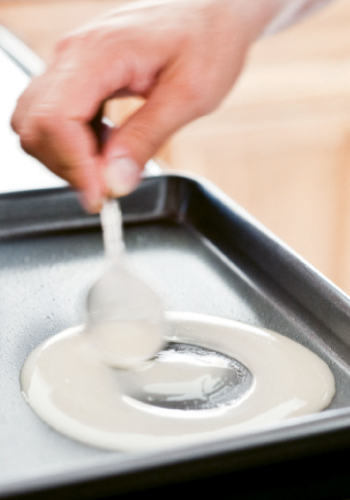 Use back of a spoon to spread batter into four-inch rounds. 2. 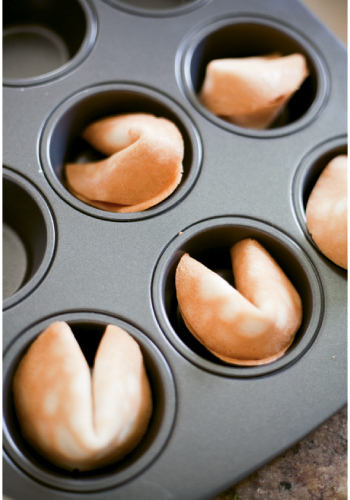 After baking, flip hot cookies over and place fortunes in center. Fold in half and bend edge over rim of a coffee mug. Cool for a few seconds. 3. Place cookies in muffin tins to hold their shape while cooling. On a warm afternoon, Marc Collins steps into his Summerville kitchen with his sons to whip up supper. Executive chef of the Wentworth Mansion’s four-star, four-diamond restaurant, Circa 1886, Marc is a big believer in introducing his boys to the joys of cooking early on. So when this chef has a night out of his restaurant, evening meal preparation in the Collins’ home becomes a family affair. Fifth-grader Matthew and first-grader Christian have selected the menu, a combination of dishes that make it obvious that “wholesome” would be a comfortable characterization of the Collins’ cuisine. 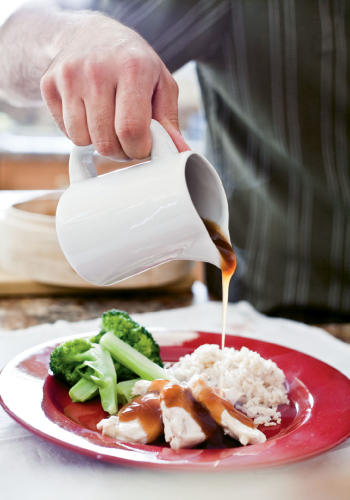 A quick and easy family fave, steamed chicken and broccoli, will be the centerpiece, accompanied by nutritious sides of brown rice and cherry applesauce. Matthew has requested edamame to snack on while Dad gives a short demo on slicing and dicing. Popping crunchy young soybeans from salt-sprinkled pods will assuage afternoon hunger. “They taste like green beans,” he says. “I can eat them all day.” Wife Jennifer has a refreshing cool drink ready: Charleston Tea Plantation American Classic tea with a little ginger ale added for sweetness and sparkle. The whole gang lends a hand in making the cherry applesauce. Christian and Jennifer pit the cherries. Matthew puts in some practice on today’s cooking lesson by dicing the Golden Delicious apples. 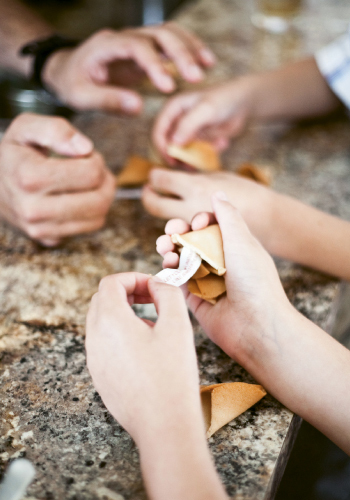 With the applesauce and rice simmering on the stove and the Chinese steamer set, the boys write messages to go in the after-dinner fortune cookies. 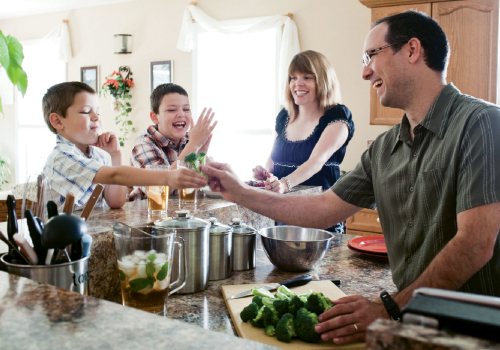 Marc keeps everyone focused as they move toward their family’s kind of happy meal—home-cooked and healthy. While the boys like light Kikkoman straight from the bottle on their chicken and broccoli, Marc and Jennifer prefer a simple garlic soy sauce, built on a base of chicken stock, that adds a layer of flavor adults can appreciate. 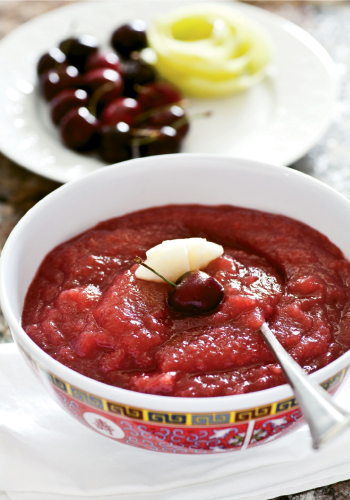 In much the same way, adding fresh cherries to the apples elevates the applesauce. The result is appealingly colorful and a little piquant, mildly sweetened by apple juice with only a touch of sugar. The boys may be developing precocious palates, but they’re still kids. Translation: it’s time for dessert, and these future gourmands want ice cream. Marc turns to gelato, Italy’s lower fat and less caloric variant of our favorite frozen scoop. Flavoring the gelato with orange and vanilla bean yields the low-key flavor profile traditional to Chinese desserts. 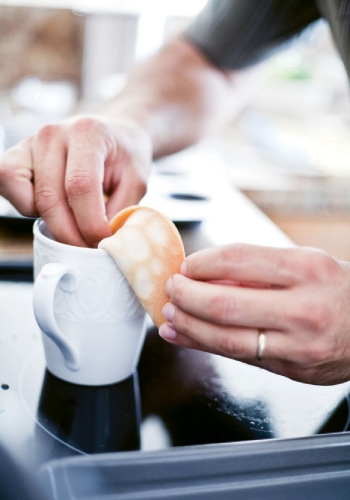 And by adding make-it-yourself fortune cookies, Marc provides a lesson in baking for the fledgling chefs.